USPoker.com An apparently tiny rule change at two casinos in Las Vegas will have pretty serious negative consequences for gamblersreported that the Las Vegas Sands company just changed its payout rules for blackjack at the Venetian and Palazzo casinos in a way that greatly hurts players’ chances of coming out ahead. In blackjack, players receive two cards and then decide if they want to “hit” and get more cards, or “stand” and use the cards they already have. The goal is to get a higher score than the dealer, based on the values of the cards, without going over 21. Should you do this, you get a payout of 1-to-1; you win as much money as you bet. 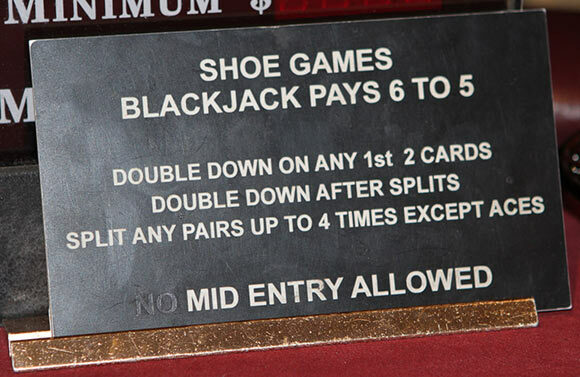 Now, at blackjack tables at the Venetian and Palazzo, the payout for a blackjack has been reduced to 6-to-5, that $10 now just wins $12 instead of $15. In terms of the industry, the rule change greatly increases the “house edge.” This is how casinos make their money. Games are set up to be slightly unfair to players in the long run, paying out a little bit less in total than what is taken in.